As the use of cellular phones has become almost ubiquitous in today’s everyday culture, both in California as well as across the country, distracted driving has becoming a correlative increasing danger. Many people are seriously injured or even killed in accidents every year caused by a distracted driver, both in California as well as elsewhere in the U.S. While the idea of distracted driving has become almost synonymous with talking or texting on a cell phone while driving, the activity encompasses much more. As a recent study reported in the LA Times reports, cell phone use has become an increasing problem. Despite the risks, drivers continue to use cell phones and do other activities while they are driving. 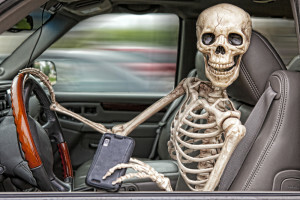 According to the Centers for Disease Control and Prevention, or CDC, an average of 1,153 people are injured and nine are killed every day due to the actions of a distracted driver in the country. That rate equated to 3,328 people killed in 2012 alone, with another 421,000 people injured in such accidents. In 2013, the U.S. Department of Transportation reported that 3,154 people were killed in accidents caused by distracted driving nationally. A recent study reported by the LA Times underscores the fact that the problem of distracted driving is a growing one in California. The state’s Office of Traffic Safety, which conducted the study, reported that one out of 10 drivers reported being distracted by texting, answering, calling or otherwise handling their cell phones while driving. The office indicates the actual number is most likely closer to one in five drivers, however. This usage represents a 40 percent increase over the numbers from just last year, an astonishing increase in such a short period of time. The reasons why using cell phones or doing other assorted activities while also driving can cause distracted driving are threefold, according to the CDC. The act of driving requires visual, cognitive and manual attention. When a driver takes their eyes off of the road, even for a couple of seconds, they lose visual attention. Similarly, thinking about other things, such as an incoming message on a cell phone, causes cognitive distraction from the act of driving. Finally, manual distraction, such as that involved with manipulating a cell phone or other electronic equipment in a car, distracts a person’s manual attention. Cell phone use while driving is thus very dangerous, as it involves distraction in all three categories. The National Highway Traffic Safety Administration, or NHTSA, reported that among drivers, young drivers up to age 20 reported the highest rate of accident involvement when they were simultaneously using a cell phone, at 13 percent. Similarly, the age group of drivers up to age 24 reported much higher rates of sending text messages or emails while driving as compared to older drivers, with between 44 and 49 percent of young drivers acknowledging doing so. A shocking study conducted by researchers at Oregon State University and reported by NPR demonstrated the extent of distracted driving behaviors in teens and youth. In the study, teens reported not only texting or talking on their cell phones while driving, they also reported engaging in a whole host of activities. While 40 percent admitted to texting while driving, some also reported engaging in such activities as changing their clothing, doing homework, changing shoes, putting on makeup or even putting in contact lens, all while also operating their vehicles. Educational campaigns regarding texting while driving have demonstrated some success. The Oregon study’s authors indicated that the results they obtained demonstrate a need to incorporate other types of distracting behaviors into driver education programs for teens. Parents should also refrain from using their cell phones and take steps to make certain their teens are well-educated about the dangers of all types of distraction while they are driving. They should themselves be good role models and not engage in similar behaviors. In addition to the possibility of receiving a ticket for distracted driving behavior, people who continue to do so despite the risks entailed subject not only themselves but also everyone on the road around them to the danger of serious injury or even death. In the event someone is seriously injured in an accident caused by a distracted driver, the injured victim may seek recompense through filing a personal injury civil lawsuit against the distracted driver for their negligence. When people are killed, their families can similarly file wrongful death civil lawsuits. Such civil actions may be filed in addition to any criminal prosecution, as they operate under two different bodies of law. Through such lawsuits, people may recover both economic and noneconomic damages. Centers for Disease Control and Prevention, “Distracted driving,” Oct. 10, 2014. LA Times, “More California motorists using phones while driving, study finds,” Katie Shepherd, July 16, 2015. National Highway Traffic Safety Administration, “Young drivers report the highest level of phone involvement in crash or near-crash incidences,” April 2012. NPR.org, “Teens say they change clothes and do homework while driving,” Maanvi Singh, March 18, 2015.